Do you need your client to upload a file when booking their appointment? To allow clients to upload a file as part of the booking process, you will need to use a file hosting service like Dropbox. In Appointlet, you will use markup language to create a hyperlink to your file hosting service. If you're not familiar with markup, don't worry about it. We will outline the method clearly in this article. Imagine that you were using Appointlet to schedule interviews with job applicants, and want to gather their resume during the booking flow. We will use this example in order to have a concrete example. Of course, this approach works for any situation where you need the attendee to upload a file. In this example we will be looking at Dropbox for file hosting, however you can use any service that suits your needs. If you don't have a Dropbox account and don't want to research alternatives, we recommend setting up a free account with them. If you're not sure how to create a file request URL, please take a look at their documentation, located here. It's quick and easy to do. Just be sure that you make the folder public so anyone can upload files to it! 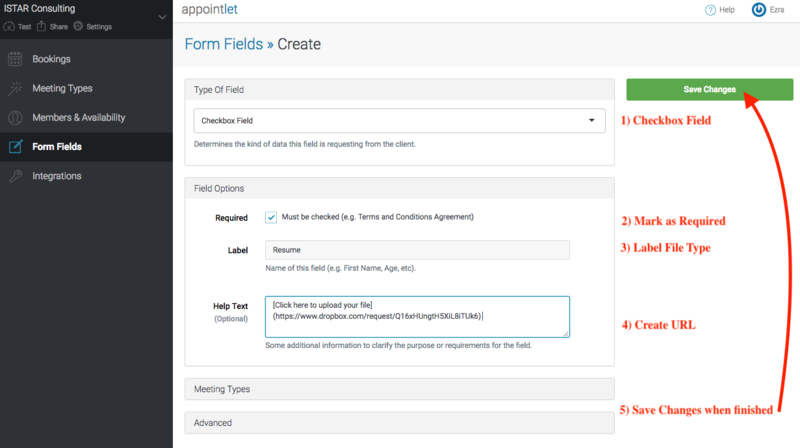 Step 2: In Appointlet, create a new form field. To begin, go to the Form Fields dashboard and click the Create button to generate a new form field. In Field Options, check the "Required" box. Give the field a label. In our demo, we will use the label "Resume" so that the attendee knows to upload their resume for the job interview. In the Help Text field you will need to use a very specific format in order to generate a hyperlink to your file hosting service. Important! There must be no space between the closing bracket and the opening parenthesis when generating your link. This is a special format called Markup. Once you've completed this process, hit the green Save Changes button and the form field will be registered. You're all finished!